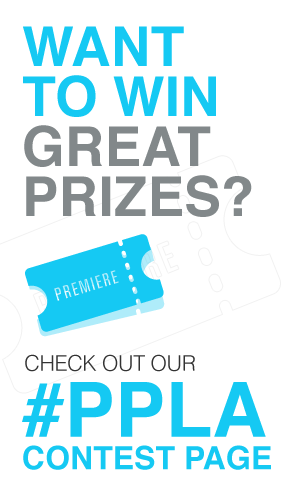 2017 Awards Season Gift Bag Pop Up Shop at Hollywood & Highland! 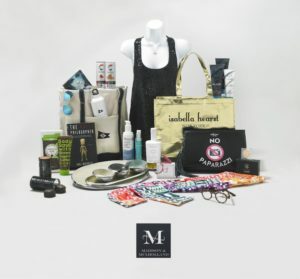 For the first time, viewers of the Academy Awards can purchase items from this year’s Madison & Mulholland Awards Season Gift Bag at a pop up shop at Hollywood & Highland, now through March 14th! This year’s bag is valued at $25,000.00 and was delivered directly to nominees including Emma Stone, Nicole Kidman, Viola Davis, Ruth Negga, Michelle Williams, Naomie Harris, Natalie Portman, Octavia Spencer and more! The great thing about the pop shop is fans can own one or more items without being a nominee or spending a small fortune! So what’s inside the Madison & Mulholland 2017 Awards Season Gift Bag? Our favorites included the Isabella Hearst “No Paparazzi” collection Italian leather luxe designer handbag. What better way for a celeb to let everyone know they’d like to be left along while drinking their lattes at Urth Cafe! The same goes for us regular folk who just want some quite time. We also loved the Neutrogena Hydro Boost Gel and Lip Treatment for smooth skin and plump lips, perfect for a red carpet smile or everyday skincare. Lastly the Julia Knight Collection set of nesting bowls, trays and spreading knife are perfect for anyone’s home! We suggest buying one for yourself and one as a gift! Each piece is a work of art, handmade of sand cast aluminum with their signature blend of enamel infused with crushed Mother-of-Pearl. Celebs where also gifted with two VIP experiences including a a stay at Baron’s Cove in Sag Harbor, NY (located in the Hamptons for those of us not familiar with this celebrity hotspot…aka us!) It’s basically known as the playground of the East Coast rich & famous. Baron’s Cove was voted the #1 Hotel in New York and Mid-Atlantic by Conde Nast Traveler Readers’ Choice Awards 2016. It is also honored with Four Diamond distinction from AAA and is rated as the #1 hotel in Sag Harbor, NY on TripAdvisor. The gift package included a 3 Night Stay in a Harbor loft Suite, Breakfast for Two each morning (that’s where that No Paparazzi bag with come in handy!) $500 Dining Credit, Two 90 Minute Massages, Yoga Daily for Two, and when in Season Wine Tasting for Two at Wolffer Estate Vineyard Welcome Amenity. The other experience comes from (think state-of-the-art 3D photography.) A-1 Array is a multi-camera system that captures single moments in time and creates three-dimensional animations for instant sharing. Pretty cool if you ask! B5LineNYC: Crafted with heart and grit. RocknRoll Grit by LA and NY Based jewelry designer, Thâmara Gia. Every piece is handcrafted and made in the USA. “The Convertible Collection” consists of bracelet and statement necklaces- turn bracelets into necklaces and necklaces into bracelets. See on Runways in NY Fashion Week. LibertiUSA: Refugee Coordinates Cuff, The Embrace Ring and Classic Cuff is designed, sourced and made in America. Every purchase made has a direct impact toward supporting resettled refugees here in USA. Bio Miracle Skincare: A new line of Coffee-based body wash and scrubs. Brushopolis: Monroe USA Glamour: hourglass round styling + finishing brush. Makes fine to medium hair straight and smooth, without the damaging heat of an iron. Perfect for lengthening bottom layers and refining fringe + The Teasedale: A performance brush engineered to create maximum volume with minimum breakage. 3 rows of 100% first-cut boar bristle, each at a different level, provide better traction than a traditional teasing brush, meaning you get more volume with fewer passes through the hair thus less breakage. The Naked Philosopher: For the thrill! An unusual Mystery/Crime novel from award-winning screenwriter Paul Margolis. Fast-paced, twisty and un-put-downable… Think Michael Connelly! Eva Keretic Singer/Songwriter – An American living in Hamburg sings from the soul. Extraordinary vocalist!